A snail with a Tardis-like shell proves that her heart is just as big. Snail and Slug are wilting in the summery heat near a small stream. After Slug bemoans her lack of a shell (or even a pocket! ), Snail invites her inside for a cold drink. “Oh, don’t worry, my house is bigger than it looks.” This proves to be an understatement, as Snail has a full kitchen (with a dishwasher), living room, two bedrooms, a library, a cellar, and an attic. During this tour, Slug and Snail get better acquainted: both lost their spouses to predators; Snail is a good reader; Slug is a good cook and likes to make up songs. And on a picnic together, Slug proves her resourcefulness and friendship. 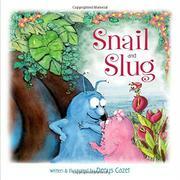 In the end, as readers will already have predicted, Snail offers to share her home with Slug. Cazet’s mixed-media illustrations in a pastel palette portray the quiet domesticity of Snail’s life and abode. The two friends look similar, Snail blue and slightly larger and with longer antennae than pink Slug. Four Eyes the bully banana slug may have readers combing their gardens, but Four Eyes’ obvious agony under Slug’s salt treatment may turn them off that time-honored pest-control method.